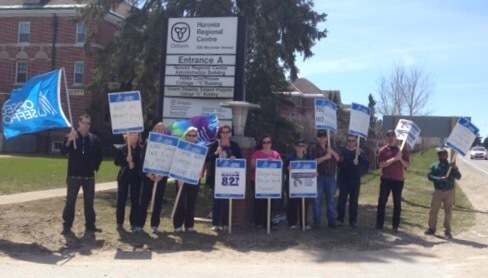 BRACEBRIDGE — The Manna Food Bank is a little richer thanks to Local 317 members who organized an OPSEU Spring Food Drive. 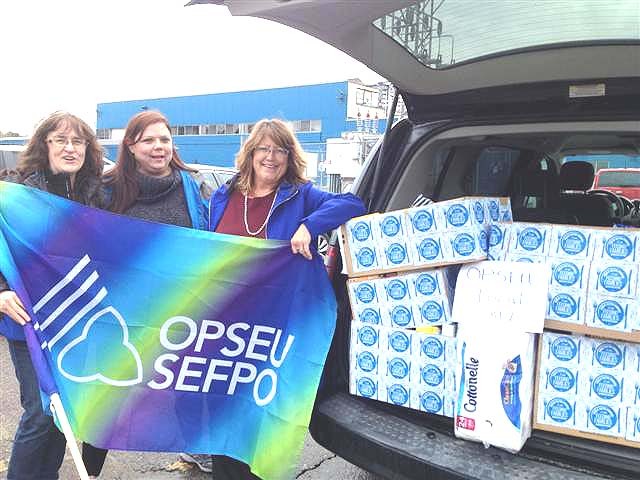 OPSEU members Michelle Craigen, Jodi Ross and Leslie Talbot dropped off the food Tuesday. 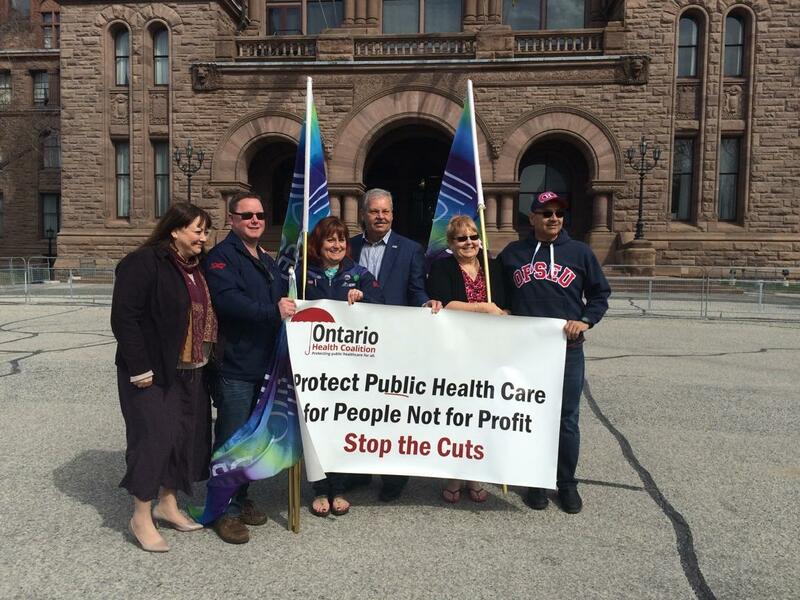 They do so not only by contributing to the economy, but also by helping their fellow citizens, says an OPSEU release. 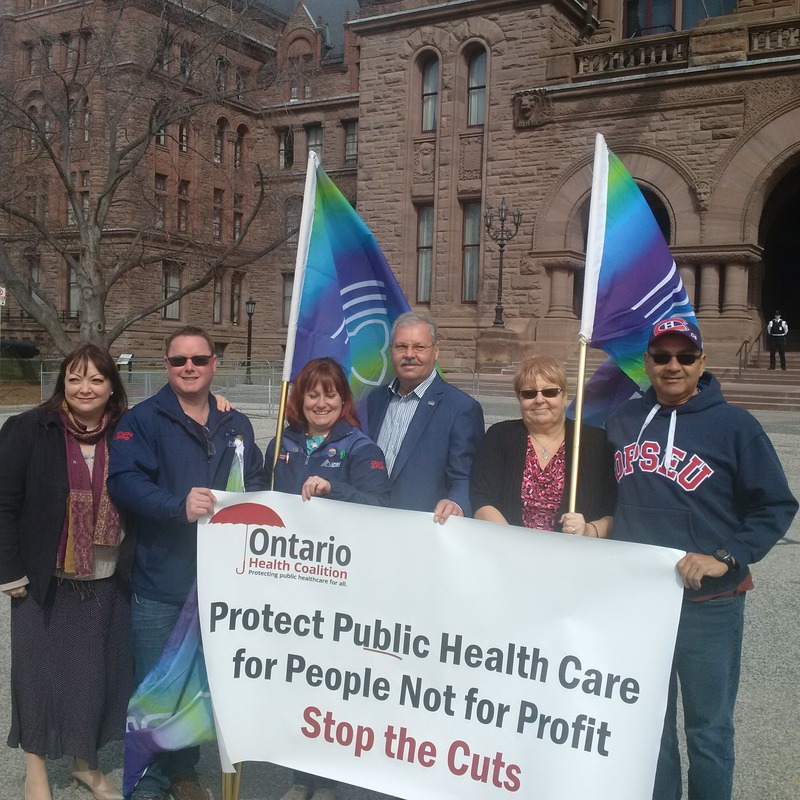 They hope that the citizens in the community realize the value of unions and their unionized employees and show support for the Ontario Public Service Employee Union members currently in bargaining with the provincial Liberal government. 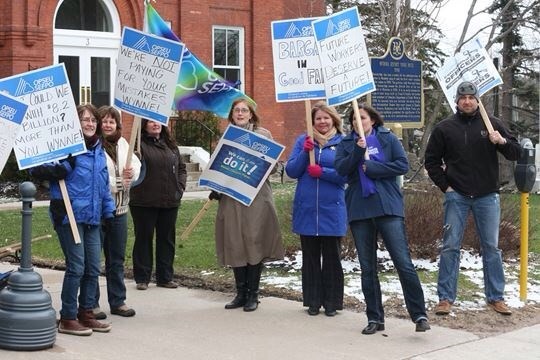 article shared by RVP Sara Labelle )MUSKOKA – A gathering of Ontario Public Service Employees Union members held an information picket in front the Bracebridge courthouse Thursday afternoon, over what the union calls is the government’s refusal to bargain a fair collective agreement. 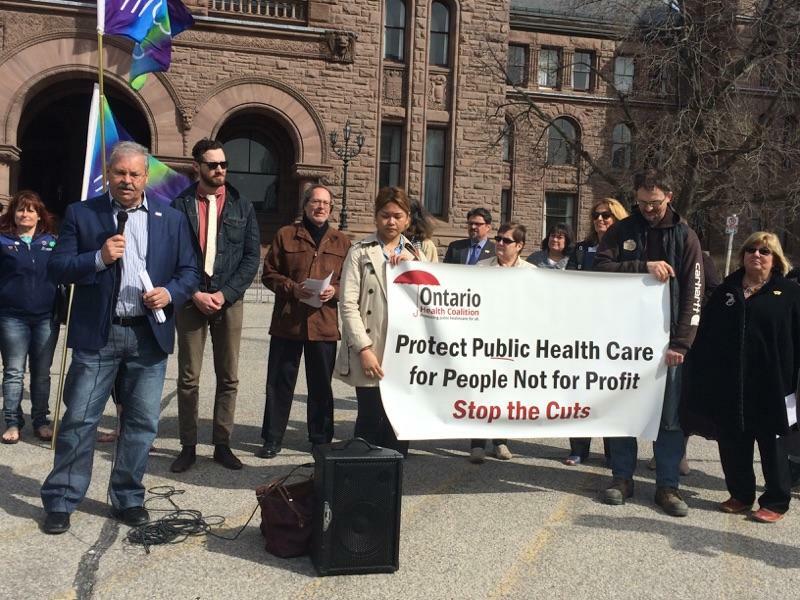 The bargaining between the Ontario government and OPSEU, which represents 35,000 workers, has reached an impasse, according to the union. 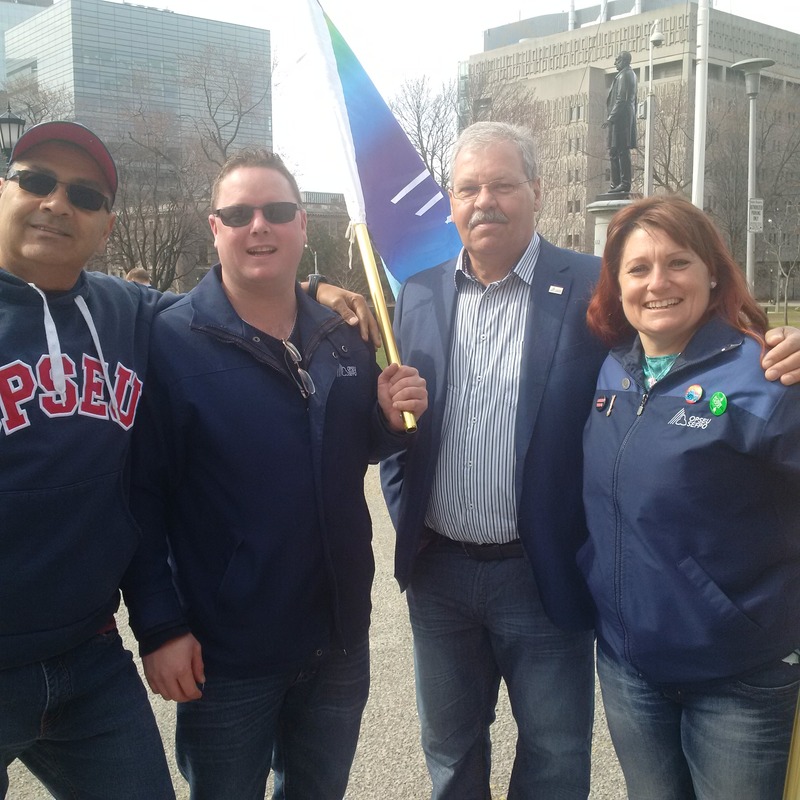 OPSEU’s previous contract has expired and the government has refused to back down from its concessionary demands despite a 90 percent strike vote from OPSEU members, the union has stated. According to OPSEU, the government wants wage freezes and a new twelve step wage grid that will see new hires come in five per cent below their current starting position, and all positions on the wage grid rolled back except for those at the very top of it. The Liberals also want to make it easier for the government to contract out services and implement layoffs. On top of this the government is looking to strip away a variety of benefits, especially for sick and injured workers, the union claims. 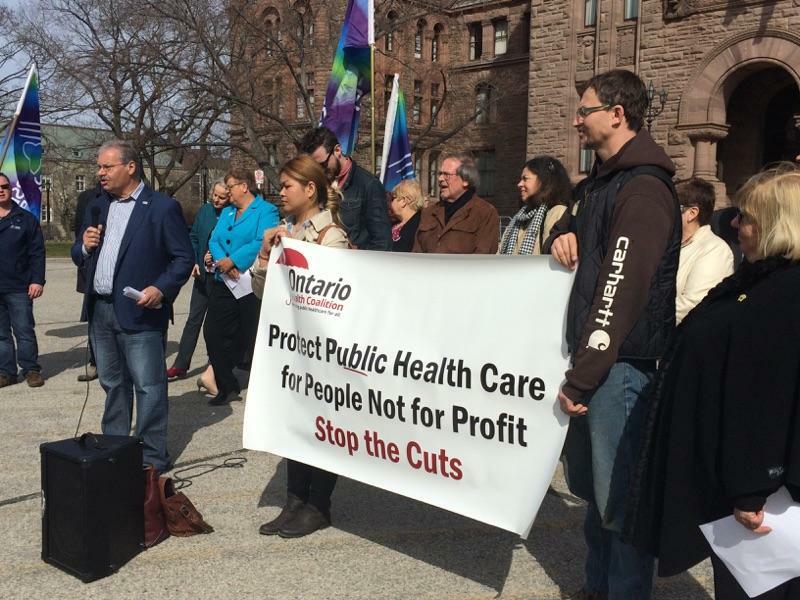 Toronto- In response to severe hospital cuts and the threat of privatization of home care and hospital services, organizations representing hundreds of thousands of seniors, patients, health care workers, nurses, health professionals and concerned citizens have joined forces to call for mass protests in each region of Ontario. In this, the eighth consecutive year of real-dollar decreases to community hospitals’ global budgets, cuts are happening everywhere. Maternity wards are under threat of closure; entire community hospitals serving hundreds of thousands of patients being closed down; outpatient clinics are being privatized, small town hospitals losing entire wards; large hospitals are facing deficits in the millions of dollars; and thousands of nurses, health professionals and hospital support staff positions being cut and eliminated. As public hospital services are being slashed, ownership and control over vital care is being privatized to for-profit companies, patients are hit with new user fees and two-tier health care is taking over. And with the recommendations of the government’s panel on home care, the last remaining public and non-profit home care services are under renewed threat of privatization. The coalition announced the first four regional “Days of Action”: mass regional protests and citizen action days to save our communities’ public health care services. These four Days of Action will be the first set of events. More will be announced in coming months. Friday, April 17, 12 p.m.
For more information: Kim Johnston, Campaign Director (416) 441-2502 (office).